My compliments to the chef...the Sweet Pea Chef. Her fish rocks! Fish does not appear regularly on my dinner table. It’s because I have a real distaste for anything that smells or tastes fishy. I’m not a picky eater, but I am really picky about fish. But then I found this recipe on the A Sweet Pea Chef blog, and I knew I was going to try it. This one intrigued me. Here’s the breakdown: tilapia fillets dipped in a combination of melted butter, garlic powder and fresh-squeezed lemon juice, then dredged in panko bread crumbs seasoned with dry mustard, nutmeg, ginger, pepper, garlic, red pepper flakes and paprika and browned in olive oil in a skillet with sliced lemons, and finished in a hot oven. Trust me, this fish does not smell fishy. It smells like heaven. The combination of lemon, olive oil, ginger, panko and spices creates magic in a pan. And the best part is that it tastes as amazing as it smells. 4. I loved the combination of spices in the panko mix – things like dry mustard, nutmeg, ginger, red pepper flakes and more. I was expecting this to be flavorful, but it was more than that. It was extraordinary. There is so much flavor in this dish, it jumps off the plate. And the roasted lemons knocked my socks off. The Complete Package is not one to dance around a food critique. He does a great job of giving me his honest opinion when I try something new. When he tried this dish, he immediately said, “Wow. Everything about this is perfect.” I didn’t even have to ask my standard new recipe question – would you eat this again? The answer is a definite, enthusiastic YES! Everything about this dish is perfect. And we will be making it again and again. Thanks, Lacey. This one is a keeper. No, a treasure. 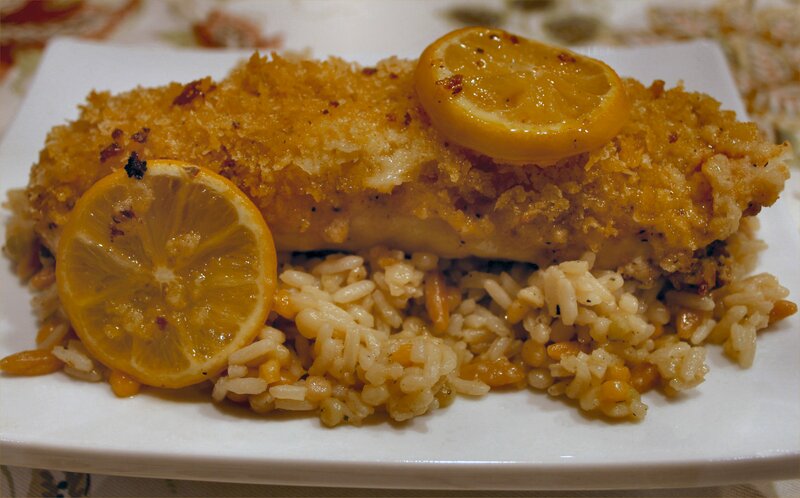 You can find the recipe and Lacey’s beautiful photos at http://www.asweetpeachef.com/entrees/panko-crusted-tilapia. That looks yummy. Can’t wait to try it out on the family! LOVE that you shared this recipe. Tilapia is the one fish that I can make that everyone will eat, but I get tired of my usual method. This looks different, but still crunchy, which is a requirement for my boys. Your boys are going to love the cruchy panko crust, and you and your husband will love the tremendous flavor of it. The ginger and roasted lemons alone are enough to put me over the edge, but when you add in all the other spices, magic happens. Make sure you put lots of sliced lemons in the skillet to roast. If you love lemon, you may just find yourself eating the roasted lemons along with your fish like I did. They add a powerful lemon zing to each bite. Drop me a comment after you make this. I’d love to hear what you thought of it! Enjoying my visits to ur blog tremendously! This looks like a great recipe! Passing it along to College girl who makes tilapia every week! I’m so excited that you’re coming back to visit over and over! I’ve been enjoying your blog, too, and love that I can check in with you and your two lovely daughters at the same time. Hope College Girl loves the tilapia recipe. It’s my new favorite fish dish. Thanks for passing it along to her!